This review has not yet been approved by the owner of this writing service. If you are the webmaster of Dissertationplanet.co.uk, please Contact Us to approve or remove this review. The website is sprawling – there is no other word for it. There are links everywhere, and useful information is spread thin all over in a way that makes it possible to find what you look for only if you take care to look closely through every page in succession. There is no visible logic to the website’s structure, and navigating it is extremely annoying – you know that what you are looking for is probably somewhere nearby, but there are no indications as to where to look for it. Prices range from £8.99 to £32.95 per page, depending on the degree of urgency and the level of quality (2:2 Standard, 2:1 Standard, First Class). Available via phone, email and chat. Chat operators quickly react to your queries and even offer to help you without your addressing them first. There is a number of samples present on the website, and they are quite awful. Firstly, they are posed as dissertations but are obviously far too short to be them. Secondly, they have obviously never been proofread and possibly even reread by the author after he completed his work on them: misprints, grammar and spelling mistakes and just plain poor wording is all over the place. This is obviously not a paper you would like to submit to your teacher, let alone college professor. You can get a free 500-word draft of your dissertation before you place an order. 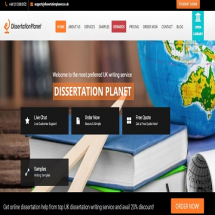 DissertationPlanet.co.uk desperately tries to look impressive and serious in its attempts, but it mostly falls short. Website is chaotic and inconvenient to navigate, writing samples are of poor quality, prices are average… Some extra features look nice, but one doubts that getting a gift coupon is worth paying £500 for a third-rate paper. Customer support is quick and responsive, but since it is obviously outsourced, it is hardly the achievement of the service per se.